Not since "Sugar Chemistry" by Shallenberger and Birch (1975) has a text clearly presented and applied basic carbohydrate chemistry to the quality attributes and functional properties of foods. Now in Food Carbohydrate Chemistry, author Wrolstad emphasizes the application of carbohydrate chemistry to understanding the chemistry, physical and functional properties of food carbohydrates. Structure and nomenclature of sugars and sugar derivatives are covered, focusing on those derivatives that exist naturally in foods or are used as food additives. Chemical reactions emphasize those that have an impact on food quality and occur under processing and storage conditions. 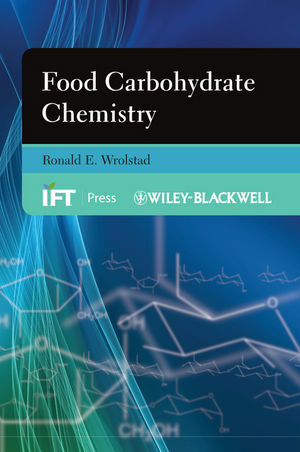 Coverage includes: how chemical and physical properties of sugars and polysaccharides affect the functional properties of foods; taste properties and non-enzymic browning reactions; the nutritional roles of carbohydrates from a food chemist's perspective; basic principles, advantages, and limitations of selected carbohydrate analytical methods. An appendix includes descriptions of proven laboratory exercises and demonstrations. Applications are emphasized, and anecdotal examples and case studies are presented. Laboratory units, homework exercises, and lecture demonstrations are included in the appendix. In addition to a complete list of cited references, a listing of key references is included with brief annotations describing their important features. Students and professionals alike will benefit from this latest addition to the IFT Press book series. In Food Carbohydrate Chemistry, upper undergraduate and graduate students will find a clear explanation of how basic principles of carbohydrate chemistry can account for and predict functional properties such as sweetness, browning potential, and solubility properties. Professionals working in product development and technical sales will value Food Carbohydrate Chemistry as a needed resource to help them understand the functionality of carbohydrate ingredients. And persons in research and quality assurance will rely upon Food Carbohydrate Chemistry for understanding the principles of carbohydrate analytical methods and the physical and chemical properties of sugars and polysaccharides. RONALD E. WROLSTAD, Ph.D. is Distinguished Professor of Food Science & Technology, Emeritus in the Department of Food Science & Technology, Oregon State University, Corvallis, OR. Dr. Wrolstad has authored over 150 professional publications, including 115 papers in refereed journals and 17 books or book chapters. He has served on the editorial boards of numerous scientific journals including Food Chemistry, Journal of Food Processing and Preservation, and Journal of Food Science Education, and has served as chair of the Food Chemistry Division and Fruit & Vegetable Division of the Institute of Food Technologists.